A contributor brings History Detectives a patent with his father's name on it. He is certain that his father worked on the famous Manhattan Project - America's covert effort to be the first to build an atomic weapon during World War II. His father refused to talk about his war assignment except to say that he sold his patent to the U.S. government for a single dollar. 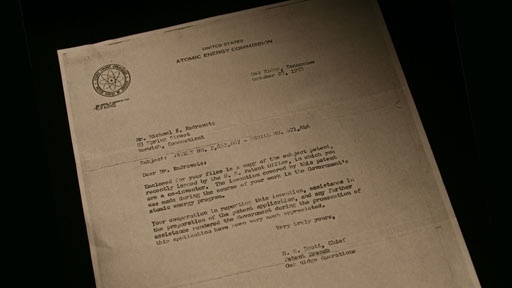 Along with the patent, our contributor has a letter from the Atomic Energy Commission stating that his father’s patent had been declassified. Was this invention used to build the Atomic Bomb? History Detectives discovers a plan to hide atomic secrets in plain sight. Also with Wes Cowan General Lee's Farewell Address Could this be a signed copy of one of the most famous documents in the history of the Civil War? Also with Wes Cowan Boarding House Flag Did this flag once save a boarding house from being burned down at the height of the Civil War?